Our sample booklet contains material from the Student Book, Planning & Teaching Pack and Assessment Pack. Contains 120 ready-made lessons, covering the whole of KS3 in a single book. See which topics are included in the Student Book, which covers Britain in the wider world, Roman times–present. Your local Hodder Education consultant can provide a bespoke quote, including up to 50% off print resources. Our free schemes of work map out teaching pathways for a 2-year KS3 or 3-year KS3. All of the planning, teaching and assessment resources you need – including 120 ready-to-play lessons – in digital, editable formats. A downloadable version of the Student Book that pupils can access on their own devices. Two photocopiable packs – one containing planning and teaching materials; one containing assessment materials. An interactive version of the Student Book for teachers to use on the whiteboard. Subscribe to the Dynamic Learning Package and you’ll get the Teaching & Learning Resources and the Whiteboard eTextbook together with 20% off. 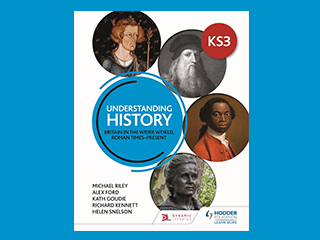 Sign up to History eUpdates and you’ll be the first to hear about new resources, download free materials and get exclusive discounts.